Yes, I’m talking about cooking! It doesn’t have to be a chore. It doesn’t have to be scary and complex, expensive or time consuming. Cooking can be and should be a fun, creative outlet. 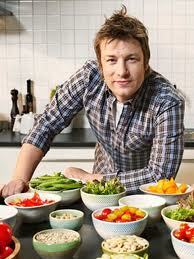 I’ve been on a Jamie Oliver kick lately. Spend a few minutes watching his shows on youtube and I guarantee he’ll get you excited to hang out in your kitchen. Yes, he’s a professional chef. Yes, he’s got mad chopping skills and loads of experience. But he didn’t always. He started with a love of food. And you can too. This entry was posted on February 6, 2012 by katelivingfull in Uncategorized.